What do you get when you cross a dolphin with a jet ski? The founders of Innespace Productions, a California watercraft company, asked themselves that question. And then they built their answer: The Seabreacher. 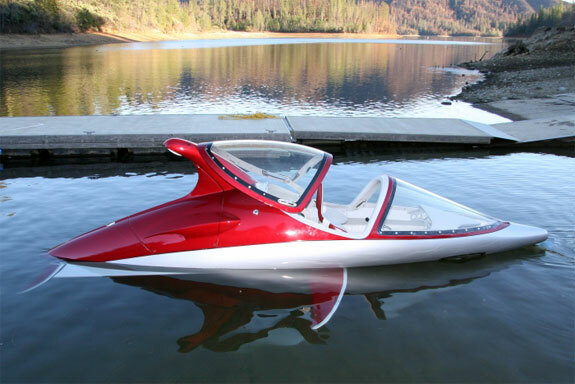 The boat-like, airplane-like, submarine-like, Flipper-like Seabreacher can accommodate a single operator and one passenger who sit in a waterproof cockpit in front of the craft’s supercharged rotary engine. 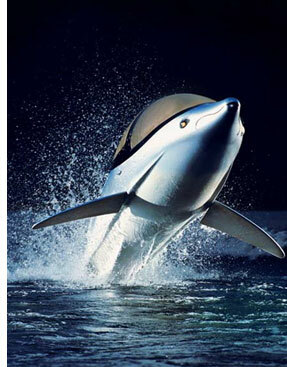 Not only does the Seabreacher resemble an oversized mechanical dolphin, it is designed to be maneuverable in some dolphinesque ways too. 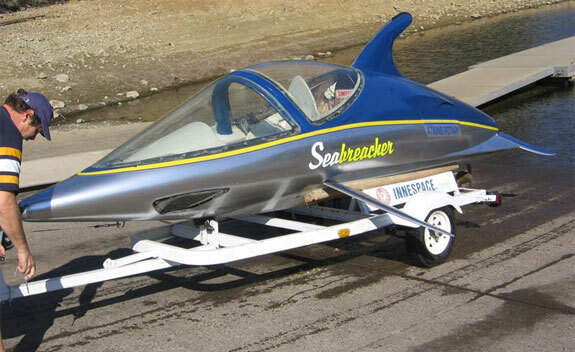 The Seabreacher can skim along the water, jump up into the air and even do barrel rolls. Check out the video below. The operator of a Seabreacher can also make the craft dive under water by creating a negative lift on the “fins” of the craft (in a way similar to how airplanes use flaps to create lift, but in reverse). 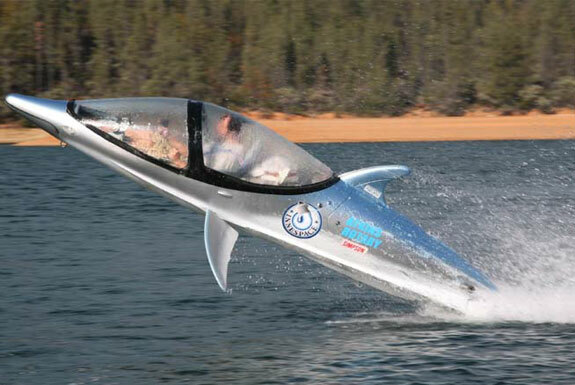 However, like a real dolphin, the Seabreacher needs oxygen—the craft can only remain completely submerged for about a minute, time enough to dive down around three feet. So how does the Seabreacher compare to the dolphin in terms of speed? Rather similarly. A dolphin’s top swimming speed is about 35 mph (55 km/h). The Seabreacher can travel a little faster than that (40 mph) on the surface of the water and a little slower (20 mph) submerged. 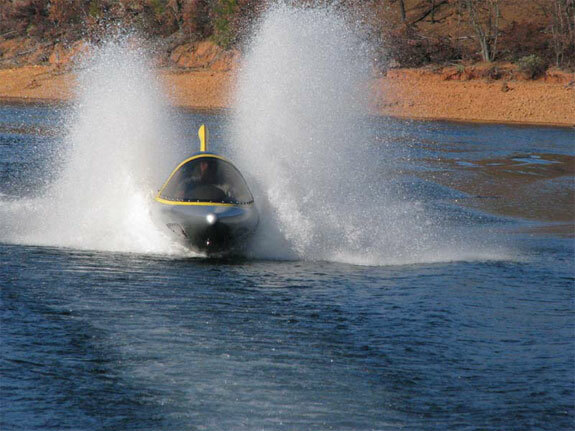 The submerged speed is particularly impressive when you figure that the underwater speeds of most personal submersibles don’t top 5 mph. You don’t need any sort of special license to operate a Seabreacher. But you do need US$48,000 to purchase a standard model, or $68,000 for a high performance one. Innespace continues working on improvements to the Seabreacher, envisioning a day when the craft could dive to 20 feet (6 meters) and swim along with groups of real dolphins. The company also sees great potential in the racing of Seabreachers and to that end has formed the Aquabatic Racing League. The racers in this league will almost certainly never be a famous or rich as NASCAR or Formula-1 race car drivers. But they’ll probably have a lot more fun. The Dolphin Submarine is looking awesome, all pics are gorgeous. I think the driver of this Submarine feels proud when he plays with the water in the ocean.